SCANDALOUS is a broadway Musical based on the book by Kathie Lee Gifford. SCANDALOUS The Musical stars Carolee Carmello as the infamous Aimee Semple McPherson. Congratulations to Kathie Lee on her Broadway debut with SCANDALOUS on Broadway! 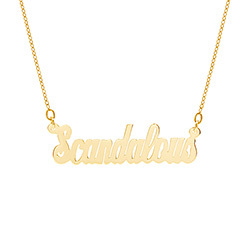 Kathie Lee was seen wearing Eve's Addiction's Scandalous Nameplate Necklace on the Today Show, Monday October 15th, 2012. Get the same SCANDALOUS necklace that Kathie Lee wore on the Today Show from Eve's Addiction!